I got the idea for this recipe when I was in India with Jack and Claire. We were in Goa and, growing tired of curry, were craving some western food for our dinner. We came upon an Italian restaurant on the edge of the beach, with plastic tables and chairs arranged under palm trees. Reputedly the pizzas and pasta were particularly good so we thought we’d give it a go. I went for ‘tomato and prawn spaghetti’ and it was absolutely delicious. 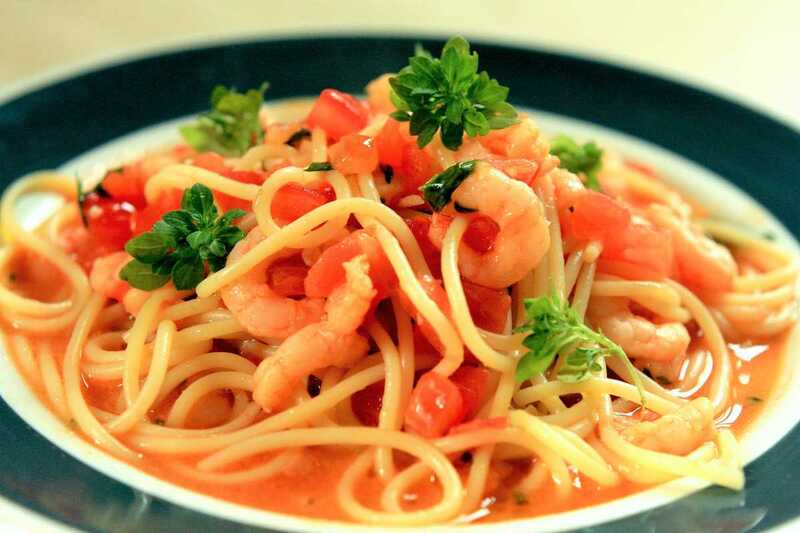 It was a simple dish, using fresh tomatoes and little baby prawns. It had a really nice light sauce and was the perfect thing to eat on a hot evening, accompanied by a chilled bottle of beer! So this is my attempt at replicating that dish. It’s basically a sauce made from tomato juice, white wine and garlic, then thickened and enriched with butter. The diced tomato flesh and prawns are then simply added to heat through, just before serving. I used frozen cooked baby prawns, but if you can find fresh ones then all the better. It’s seasonal too; tomatoes are just about still good at this time of year, so make the most of it! Get a pan of salted boiling water on the go; this will be for blanching the tomatoes and cooking the spaghetti. To peel the tomatoes: carefully cut out the stalk with the tip of a small knife and score a cross in the bottom. Get a large bowl of very cold water ready, drop the tomatoes in the boiling water for 15 seconds, then remove and place straight into the cold water. Once the water has come back to the boil, add a glug of olive oil, put in the spaghetti and cook according to the packet instructions. Peel the tomatoes, discard the skin then quarter, de-seed (reserving the pulp and seeds) and cut the flesh into small dice. Set aside the dice (this is called tomato concasse).Take the pulp and seeds, blitz in a blender and pass through a fine sieve into a saucepan. Heat another saucepan over a medium heat, and add a glug of olive oil. Add the garlic and sauté gently for 30 seconds. and add the wine. Bring to the boil and simmer for 5 minutes. Whisk in the butter cut into small dice piece by piece, being sure to emulsify properly. Add the tomato concasse, prawns and basil. Add the spaghetti and mix everything together, making sure the pasta is nicely coated with the sauce. Taste and season with salt and freshly pepper. Serve and eat immediately!